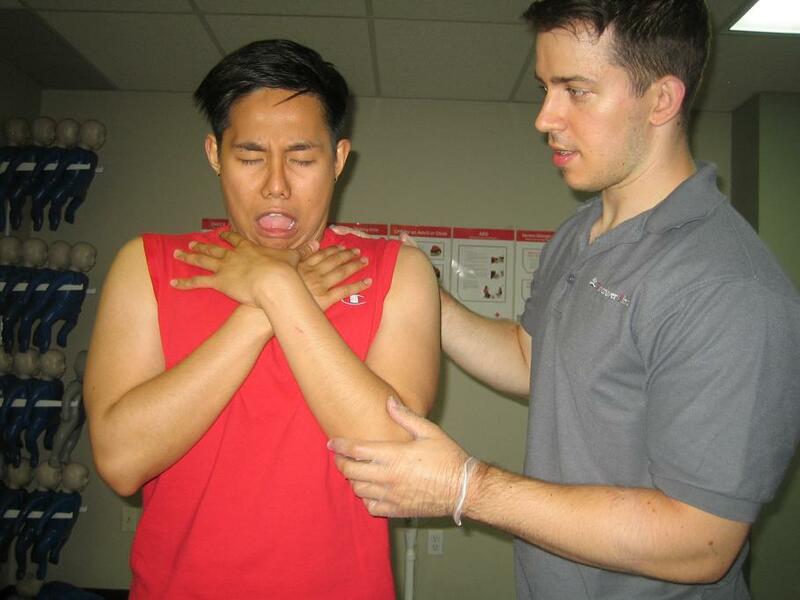 Toronto First Aid is located in Toronto, Ontario and offers trainees looking for first aid training, quality programs taught by St Mark James certified instructors. Cardiopulmonary resuscitation (CPR) training is also available. Students are offered a large selection of classes at very cheap course fees. Popular St Mark James training programs includes childcare, emergency and standard first aid. Participants can also register for CPR “only” courses. On-line safety courses are also available which include WHMIS and TDG training. Individuals that work in the food serving, preparing and storing industry may be interested in enrolling in food handling courses. Finding the right schedule for you is very easy with plenty of courses available at varying locations and at low prices. You can find a list of schedules on the Toronto First Aid website. Registration can also be completed using our on-line registration form (click the button to the right) or you can contact this provider for first aid courses in Toronto using the details posted below. There are four ways to sign up or enrol for a class: e-mail, telephone calls, registration forms, and walk-ins. The registration form can be found on the Toronto First Aid website. Any requests made through e-mail or the website will only be replied to during business hours. Make sure to transact any in-person enrolments and telephone calls during business hours as well. All fees are paid for or settled before training starts, preferably during enrolment so students don’t worry incurring additional expenses. Total fees include tuition, taxes, certificates, registration expenses, and training manuals. Students who drop out receive full refunds from Red Deer First Aid, provided a 72 hour notice is done beforehand. First aid training programs are available throughout the entire week. The program is 14-16 hours long in total. The first aid curriculum includes topics such as bandaging, wound care, managing burn injuries and fall emergencies, and cardiopulmonary resuscitation. There are also stand-alone CPR classes, also inclusive of automated external defibrillation (AED). AEDs are machines that supply the heart with needed electrical shock. CPR classes have three categories: A, C, and HCP. All three include CPR training for adult victims. C and HCP include CPR training for pediatric victims. CPR training programs are 4, 5, and 6 hours long. Certificate cards from St Mark James are awarded to students upon completing a program. Wall-mount certificates are available upon request. Certificates are renewable within every three years through recertification. Standard First aid recertification is available at least twice a week. The program is approximately 8 hours long in total. CPR C is included in first aid certificate renewal. CPR-only classes only have recertification for level C and HCP. These are four hours long, twice a week. Please ensure you meet required prerequisites prior to registering for the course. Instructors at Toronto First Aid are available for special training at home or for events. Inquire for rates and schedules on the Toronto First Aid website or through e-mail or telephone call. Companies and large groups of trainees usually opt to enrol in private classes. We respect your privacy and are committed to keeping your information private. We adhere to strict privacy policies and will not release your information to any third parties. Your information will be sent to Toronto First Aid. They will contact you within 1 business hour. Bulging/ruptured discs – discs separate the bones of the spine from rubbing against each other and causing pain. A disc that is ruptured can cause the bone to press on the nerve endings, causing back pain.